Apply now to reserve your place in Cusco, Peru. GENERAL LOCATION: This course starts in Lima, Peru’s coastal capital, then moves to our base in Cusco, gateway to Machu Picchu and other archeological sites in the breathtaking Andes Mountains. FOCUS: Multimedia journalism revealing how climate change and imperialism has affected the multicultural people of Peru, historically and today. COOPERATING UNIVERSITIES: University of Jamestown; Ball State University. CONTACT: Questions about the Peru Project? Contact Program Director Mike Dorsher, Ph.D., at: (mike.dorsher@ieimedia.com). A generation ago, Peru was a hotbed of political unrest, poverty and narco-terrorism. But now it is one of the world’s safest, most-stable countries and growing economies. Machu Picchu is truly one of the seven wonders of the modern world, but there’s also so much more for student journalists to cover in Peru: world-class cuisine, a World Cup futbol team, Latin jazz in Lima, artisan weavers in Cusco, art and diplomacy in Lima and, of course, the effects of climate change at altitudes ranging from sea level to 16,000 feet above. The Andes will have you jumping for joy, too. For the first four days, we’ll report from Lima, Peru’s capital and the second-largest city in South America, with nearly 9 million people. We will hit the ground running, because even though it’s a long flight, Lima is on the same time as Chicago, so we won’t have any of the jet lag that makes the first few days in Europe so challenging. That’s why we can complete this course in three weeks instead of four, still earn the same three credits of upper-division journalism electives, still be qualified for a Gilman study abroad scholarship if you’re a Pell grant recipient – and otherwise pay just $3,995 for the course instead of $4,995. 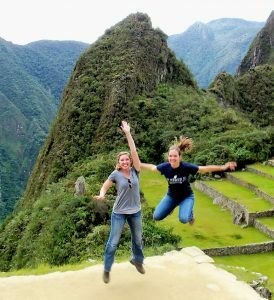 Included in your fees is our roundtrip airfare from Lima to Cusco, perched 11,000 feet (i.e., two miles!) above sea level amid the majestic Andes Mountains. In Cusco, we will settle into a routine of each morning’s Spanish language and Peru culture lessons – customized for you whether you’ve never spoken Spanish or are nearly fluent – followed by journalism lessons. We’ll break for a leisurely lunch and siesta, as the Peruvians do. Then we’ll spend our afternoons out reporting and researching -- with faculty and interpreters -- and later producing and editing packages of multimedia stories and releases. Cusco is a UNESCO World Heritage Site steeped in native culture, but it is also one of the Andes’ largest cities, with a population now exceeding 430,000. Incan ruins displaying ingenious architecture and engineering are all around Cusco, but of course our climactic reporting trip will be to Machu Picchu, and the 125-mile roundtrip train ride there is included in your fees, too. Our course will end with a marathon production and editing session, making sure everyone leaves with a great digital “clip.” We’ll finish on Aug. 8 with a farewell dinner to celebrate our accomplishments, our insights and our friendships among classmates from across the U.S. and Canada. The next morning, we’ll fly back to Lima. From there, students can catch return flights to North America – or for independent travel throughout Latin America. Fantastico, en verdad? 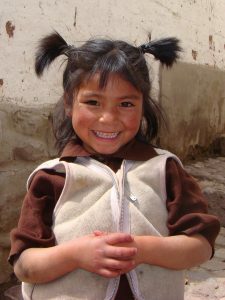 Peruvian children are seldom shy. Students will earn three credits of upper-division communication electives for this course, either in journalism or public relations. The credits will be issued by the University of Jamestown, and we will work with you so they are easily transferable to your university. In Cusco, students will stay in pairs with professional host families, vetted by “Mundo Antiguo.” You’ll eat two meals a day with them and get their inside tips on culture, sights and sources. Plus, there’s no better way to practice and expand upon the Spanish you’re learning in class each morning. You’ll have authentic exchanges in Spanish – with interpreters or on your own. Michael Dorsher, Ph.D., (Peru Program Director and ieiMedia Executive Director) is an emeritus professor of journalism at the University of Wisconsin-Eau Claire and a former Fulbright Scholar at McGill University in Montréal. Advanced in French and Spanish, Mike was ieiMedia’s program director in Nice, France, in 2014-16, and he previously led journalism students to Peru and England. He was an award-winning journalist for 20 years, capped by four years as a founding editor of washingtonpost.com. Kay L. Colley, Ph.D., (multimedia faculty) is an associate professor and chair of the Department of Mass Communication at Texas Wesleyan University. She teaches public relations, social media and international communications courses. Previously, she taught journalism at Texas Wesleyan, the University of North Texas, Texas A&M and Blinn College. She holds multimedia and social media certificates from the Poynter Institute and is Hootsuite and Hubspot certified. Jayne Cubbage, Ph.D., (multimedia faculty) is an assistant professor of communications at Bowie State University in Maryland, where she teaches in the graduate program in organizational communication. Prior to teaching, she had more than 20 years of experience in broadcast, print and multimedia journalism. She spent most of her career at news outlets in Philadelphia, where she was a news producer, associate producer, writer, assignment editor and on-air talent. She has also worked in print as a news editor and freelance writer as well as a public relations specialist. Sharon S. Kessler, MPA, (social media faculty) is a freelance writer in the Minneapolis-St. Paul area who was an editor at the Minneapolis-based Star Tribune for nearly 10 years and The Washington Post for nearly five years. She is a certified digital marketing professional, and she was an interactive media strategist for the nonprofit Saint Paul Foundation. She was a visiting journalist in ieiMedia’s Nice, France, programs in 2014 and 2015, and in Peru in 2012. View complete faculty biographies on our Peru Faculty Page. The cost is $3,995 plus airfare. Included: tuition – 3 credits, accommodations and two meals a day with a host family, farewell dinner, travel insurance, Spanish and journalism or PR lessons, airfare between Lima and Cusco, train fare between Cusco and Machu Picchu. Graduates and students who do not need credit can deduct $450 from the program cost. Apply now to reserve your place in the Peru Project. Or, contact Program Director Mike Dorsher at: mike.dorsher@ieimedia.com. Students must fill out the online application and include contact information for two references using the “Apply Now” link. A $100 application fee is required with the application but will be applied in full to your program fees or refunded if you are not accepted into the program. Application deadline: March 1, 2019.